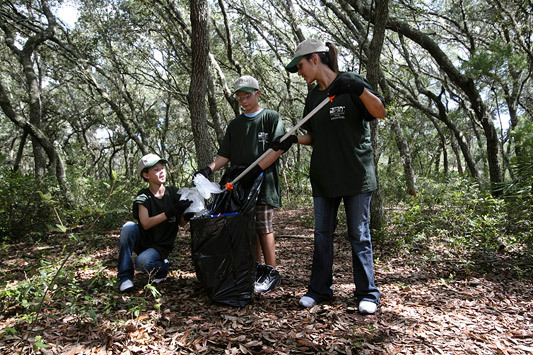 Volunteering is a great way to give back to your community, make friends, learn skills, and enjoy Florida’s beautiful natural areas. To meet various water management needs, the District has protected more than 436,000 acres of land in southwest Florida. These lands are important for protecting public water resources, preserving Florida’s natural communities, protecting habitat for endangered plants and wildlife and providing healthy outdoor recreation. It is the responsibility of the District’s Land Resources Department to preserve ecosystems and habitats on District-owned lands and provide public recreational opportunities that are compatible with District goals. The Volunteer Program was designed to help the District accomplish its goals and to give volunteers an opportunity to participate in and learn about the management of conservation lands within the District. The Volunteer Program depends upon the combined efforts of many individuals for its successful operation. Projects are typically done in wilderness-type areas. The District provides all tools, safety equipment and other items needed to work in the outdoors. Safe practices and tool handling training is offered regularly. Volunteers may work on short-term projects or longer, several-day projects. Volunteering with the District’s Land Resources Department is a great way to give back to your local community, make new friends, learn new skills and enjoy Florida’s beautiful natural areas. Over the years, volunteers have contributed thousands of hours toward projects such as constructing and maintaining trails, establishing campsites, building picnic areas, cleaning up trash and debris, and many other important land improvement projects. So, whether you would like to volunteer to work on an individual project or group project or become part of a citizen support organization, the District has opportunities to fit the needs and abilities of everyone. Information and application forms are available by contacting the Southwest Florida Water Management District’s Land Resources Department.